In view of GDPR, MagNews has developed her Consent Tracker: a solution inside the MagNews email marketing platform to help marketers tackle part of the regulatory obligations introduced by GDPR. In just a few weeks the GDPR (General Data Protection Regulation) will be directly applicable in all Member States. Why is tracking consent so important? The GDPR states that the processing of personal data must be based on an appropriate legal basis, specifying consent by the data subject as an explicit condition of lawfulness. This is one of the most used legal bases for marketing. In most cases the relationship between data controller and data subject originates from explicit consent. The GDPR requires that the consent be freely given, specific, informed and unambiguous, as well as expressed through clear affirmative action. Under GDPR, the data controller also must at any time be able to provide proof of compliance both to the Data Protection Authority and to the data subjects. If the basis for storing personal data is consent, then proving consent, will make personal data processing legitimate. Therefore, preferences expressed by subjects of whom we collect data (usually our contacts) must be comprehensively recorded and preserved. Many companies would love “GDPR-proof email marketing software” to automatically (and magically) be compliant. But the Regulation doesn’t provide a pre-packaged recipe on how consent should be documented. Each company should assess what information they track and store case-by-case. There is no such thing as GDPR-proof email marketing software, because there is no standard solution which is identical for everybody. The consent tracker is a flexible tool for managing some of the key aspects of the new Regulation. With GDPR on its way, it is more essential than ever to have a flexible and effective tool, allowing data controllers to make decisions freely and independently. 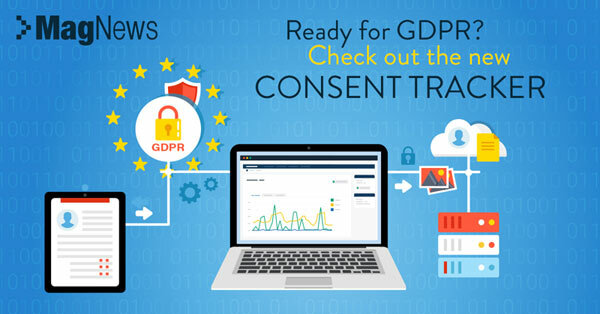 Dealing with the GDPR, MagNews has developed her Consent Tracker: a solution to help marketers tackle regulatory obligations introduced by GDPR. Let’s have a look at its main features. The Consent Tracker is a platform add-on designed to make it easy to keep track of consent granted by data subjects (e.g. customers and potential customers). It is a flexible and customizable solution, enabling marketers to automate tracking of any event deemed relevant for providing evidence of consent. The goal of this solution is to allow simple management of any changes to consent by contacts within MagNews databases. It lives in a single environment, providing technological support to those who are required to comply with the obligations introduced by GDPR. How does the Consent tracker work? The Consent Tracker allows selective and targeted logging of events for proving consent. 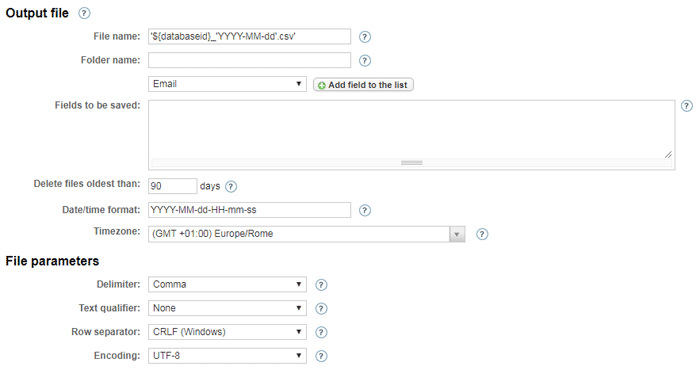 Tracking will start when the value of at least one of those fields changes. The system generates a daily log file, which can be exported and kept either inside or outside the platform. The Consent Tracker allows tracking both explicit consent acquisition, variation or revoking, as well as any changes to personal data for which consent had been previously given (e.g. email address changes). Another essential feature concerns variations to “monitored fields”. All log information is never overwritten, allowing you to keep track of all changes over time. One of the most remarkable features of the Consent Tracker is its ability to track consent from multiple touchpoints. This means both inside and outside the email marketing platform. If configured properly, it can for example track changes to consent made by contacts through MagNews forms, or by third parties upon their request through other channels (phone, certified email, etc.) or through webservice calls from apps outside MagNews (CRMs, eCommerce platforms, private areas on websites, etc.). The company could configure the Consent Tracker so that each time the value of a personal data or consent field changes, a “snapshot” is taken and a record is written to file, containing the tracked data. In addition to the event date and time and other context information previously collected (e.g. IP address, consent identification fields, URL of the form page, identifier of the policy text displayed to the contact, etc.). The MagNews Consent Tracker is available now for all current MagNews clients. More features are expected to be released in relation to GDPR and its regulatory framework, the team hinted one will especially be of great interest to those needing to send newsletters exclusively through encrypted channels.